Trace elements were analysed in rocks and minerals from three sections across the Merensky Reef in the Rustenburg Platinum Mine in the Bushveld Complex of South Africa. Whole rocks and separated minerals were analysed by inductively coupled plasma-mass-spectrometer (ICP-MS) and in situ analyses were carried out by ion microprobe and by laser-source ICP-MS. Merensky Reef pyroxenites contain extremely high concentrations of a wide range of trace elements. These include elements incompatible with normal silicate minerals as well as siderophile and chalcophile elements. For major elements and compatible trace elements, the measured concentrations in cumulus phases and the bulk rock compositions are similar. For highly incompatible elements, however, concentrations in bulk rocks are far higher than those measured in the cumulus phases. In situ analyses of plagioclase have far lower concentrations of Th, Zr and rare earth elements than ICP-MS analyses of bulk separates of plagioclase, a difference that is attributed to the presence of trace-element-rich accessory phases in the bulk mineral separates. We used these data to calculate the trace-element composition of the magmas parental to the Merensky Unit and adjacent norites. 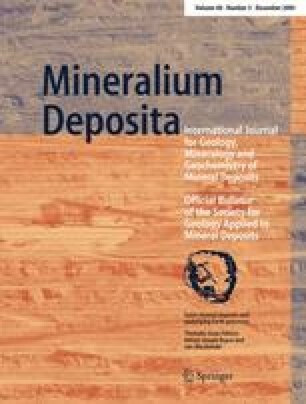 We argue that there is no reason to assume that the amount of trapped liquid in the Merensky orthopyroxenite was far greater than in the norites and we found that the pyroxenite formed from a liquid with higher concentrations of incompatible trace elements than the liquid that formed the norites. We propose that the Bushveld Complex was fed by magma from a deeper magma chamber that had been progressively assimilating its crustal wall rocks. The magma that gave rise to the Merensky Unit was the more contaminated and unusually rich in incompatible trace elements, and when it entered the main Bushveld chamber it precipitated the unusual phases that characterize the Merensky Reef. The hybrid magma segregated sulphides or platinum-group-element-rich phases during the course of the contamination in the lower chamber. These phases accumulated following irruption into the main Bushveld chamber to form the Merensky ore deposits. We thank Chris Lee for providing the samples and for many useful discussions. M. Cheadle, R. Cawthorn and A. Boudreau reviewed an earlier version of the manuscript and we benefited from useful discussions with J. Bédard. C. Ballhaus and W. Maier reviewed this manuscript and provided many worthwhile comments and suggestions. The work was supported by EarthISE a bilateral program of the French Ministry of Education and the South African Research Council by the French CNRS through the Groupement de Recherche de Métallogénie and by an NSERC grant to GAJ.